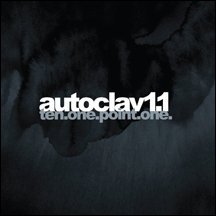 WTII Records » Autoclav1.1 | ten.one.point.one. Home » Releases » Autoclav1.1 » ten.one.point.one. Tony Young aka: Autoclav1.1 celebrates his 10th Anniversary with a new label to call home and a new album to celebrate this monumental feat. Ten.one.point.one fuses orchestral compositions and IDM with flashes of industrial, rock and modern electronica. Autoclav1.1 has gained a reputation for pulling on the deepest of human emotions with a variety of melody, frequently torn apart by paranoid beatwork and broken rhythmical structures. This Autoclav1.1 signature formula is ever present throughout Ten.one.point.one. From the dark soundscapes and haunting piano of "16a" to the break beats "Your Face Goes Here," Autoclav1.1 continues to push new boundaries and proves things only get better with age.